Satrik Ersang: The name ‘Satrik Ersang’ is from the Zhang Zhung language. She also emanates as the Wise Loving Mother known as Sherap Chamma. The name ‘Sherap Chamma’ is from the Tibetan language and has the same meaning as the name ‘Satrik Ersang’, Wise Loving Mother. Satrik Ersang appears as gold colored with a single face and two hands. In her right hand, she holds the Five Warrior Seed Syllables. In her left hand, she holds a mirror. She sits upon a throne held aloft by lions. Surrounding her throughout the ten directions are: 1) the fifty peaceful, white goddesses who are emanations of her Body and who hold the Five Warrior Seed Syllables and a mirror, 2) the fifty peaceful, green goddesses who are emanations of her Speech and who hold the Five Warrior Seed Syllables and a mirror, 3) the fifty peaceful, red goddesses who are emanations of her Quality and who hold the Five Warrior Seed Syllables and a mirror, 4) the fifty peaceful, blue goddesses who are emanations of her Activity and who hold the Five Warrior Seed Syllables and a mirror. and 5) the fifty peaceful, gold colored goddesses who are emanations of her Mind and who hold the Five Warrior Seed Syllables and a mirror. Together, these five groups of goddesses constitute her retinue of two hundred and fifty goddess emanations. Shenlha Ökar, also known as The Great, White Deity: In his manifestation as one of The Four Principal Enlightened Ones, he is white in color, his right hand holds an iron hook and his left hand is in the mudra of equanimity. He sits upon a throne held aloft by elephants. Similarly, he is surrounded in the ten directions by fifty emanations of his Body who are white, fifty emanations of his Speech who are green, fifty emanations of his Quality who are red, fifty emanations of his Activity who are blue, and fifty emanations of his Mind who are gold colored. All of these emanations hold an iron hook and the mudra of equanimity. Sangpo Bumtri, also known as the White Deity of Phenomenal Existence: He is white in color and sits upon a throne held aloft by garudas. His right hands holds a victory banner and his left hand is in the mudra of equanimity. Surrounding him throughout phenomenal space are fifty emanations of his Body who are white, fifty emanations of his Speech who are green, fifty emanations of his Quality who are red, fifty emanations of his Activity who are blue, and fifty emanations of his Mind who are gold colored. All of these emanations hold a victory banner and the mudra of equanimity. 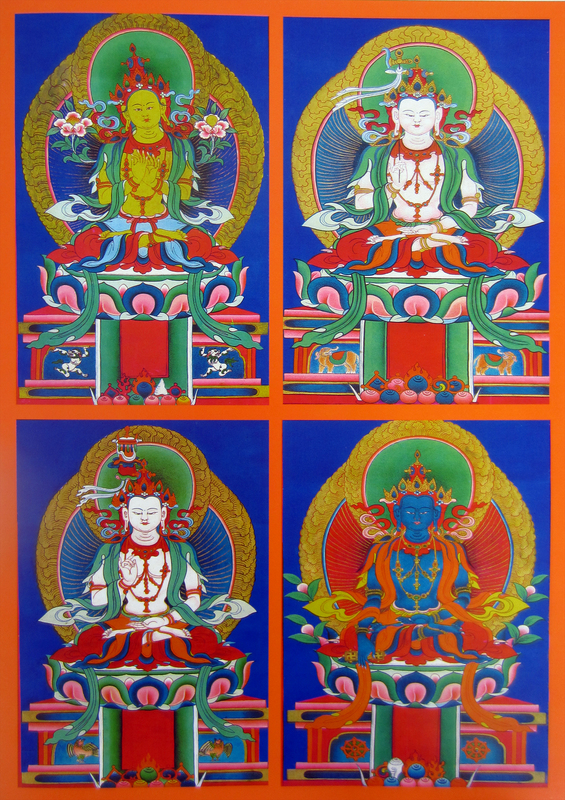 Tönpa Shenrap: In his manifestation as one of The Four Principal Enlightened Ones, he is blue in color and holds a chakshing in his right hand and his left hand holds the mudra of equanimity. He sits upon a throne held aloft by wheels of Bön. He is surrounded throughout the ten directions by two hundred fifty shenrap manifestations: fifty emanations of his Body who are white, fifty emanations of his Speech who are green, fifty emanations of his Quality who are red, fifty emanations of his Activity who are blue, and fifty emanations of his Mind who are gold colored. All of these emanations hold a chakshing and the mudra of equanimity. Posted on August 20, 2016, in Iconography, Tonpa Shenrap, Uncategorized, Zhang Zhung. Bookmark the permalink. 3 Comments.